> I am Barrister Fred Odia, the legal the Property Manager to late Mrs. A. > Properties were in my care. > between me and the owner of the properties before she death. > what I deposited with them was "Family Treasure. > wickedness, and do that which is lawful and right, he shall live thereby". > the name of God. > Thanks for your respond, It's never a scam. > Why can't you give a tryer if you have faith in God as your creator.Help me do the work of God and see what God we do in your Life. > I wait to hear from you. > Thank you very much again for your email, and you to make up your mind if really you want to do the work of God with me. I can never lie with the name of our father Lord JESUS CHRIST. > Late Mrs. A. Michael. A Foreign Woman that lived in my Country Nigeria for 21 years before they died in the Belle view plane crash.October 2005. This Lady was a good Christian, she so Dedicated to God but she lost her husband so early and she had no child till she died. Throughout her stayed in my country, she acquired a lot of properties like Lands, house properties, etc. As her legal adviser, before she death,she Instructed me to write her WILL. Because she had no child, she dedicated her wealth to God. According to the WILL, the properties have to be sold and the money will be given out to a Foreign ministry for the work of God, Orphanages and less privileges ones. As Their legal adviser, all the documents for the Properties were in my care. > I want you to send me your personal details like your full name, your mailing address where the consignment will be deliver to you, your age and occupation and also your a copy of you drivers license for purpose. > Finally,grace be with all that love our Lord Jesus Christ in sincerity Ephesians 6:24.Hallelujah that Our Lord Jesus Christ is with his Children all the time. > I do not want to write so much on the procedure so that, you won't be confused but, I'm happy to inform you that, its simple and fast. I will be waiting to hear from you today to enable me give you the information you will need to reach the Security Company for onward process of this transaction as anticipated. 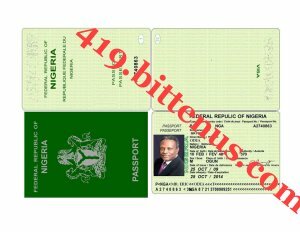 I have also attached my passport copy for your perusal but please, keep it highly confidential and for your eyes alone. Awaiting your urgent response. > May the pace of the lord be with you and your family,I want you to trust inGod and work with faith. I can never lie to you with the name of God to take your money away from you, All i need from you is your trust and honesty to carry out this work ofGod, You have nothing to worry about because you are not going to lose anything asfar as you work with my instruction. > I will like you to send me your personal information in your next email so that ican link you up with the security company were the consignment is deposited. > Also try and call me so that we can talk further about this project. > How are you today, I hope all is well with you, I did not hear from you again, Please get back to me so that we can procced aheadwith the next step. > Thankyou for your email, Now, I'm telling you that you have nothingto lose or to worry about, If it is any comfort to you, remember the story of Annanias and Sapphira. God made them both drop dead for defrauding Him, and you learned how to live right through their mistake. So, if you are a so-called man of God, like myself, who knows full well the penalty of robbing God, cheats you, what do you think He'll do to me? do you honestly think God would let His money, which is meant for the furtherance of His kingdom, be stolen. > My friend, maintain the same trust in God that you started-out with, because you are in the hands of God, and unless I'm mistaken, God said that the steps of a righteous man are ordered by the Lord. You see, my friend you're not the only one who is on a quest to show God that you can be trusted. > I really didn't mean to offend you. Let's do the work of God, brother i can never scam you with the name of God beleive me, Those email you saw may likly be the email of the impersonetors who have little idea of the project, just go ahead and send me your personal information so i can give you the contact information of the security company were the consignment is deposited. Please try and give me a call so that we can talk further. > I wait to hear from you as soon as possible. > My friend, God is in control. > How are you and your family doing today, I hope well. As i told you that you don't have to fear about anything because this project is 100% legal and risk free, Just trust in God, grace be with all that love our Lord Jesus Christ in sincerity Ephesians 6:24.Halleluyah that Our Lord Jesus Christ is with his Children all the time. > I don't want you to be confused but I inform you that it is simple and fast. I will be waiting to hear from you today with your personalinformation toenable me give you the information require to reach the Security Company for onward process of this transaction as anticipated. > 2. . YOUR CONTACT ADDRESS (Where you want the consignment to deliver you). > 4. .YOUR AGE:. . . . . . . . . . . . . . . . .
> 5. .YOUR OCCUPATION. . . . . . . . . . . .
> 6. .A SCANNED COPY OF YOUR PICTURE OR ID FOR IDENTIFICATION PURPOSE. > Get back to me as soon as possible. Subject: From Mr Fred Odia. How are you today my dear brother in christ , Fine i hope? I did not hear from you again since my last email to you, were are younow. Please i want to hear from you let me know the development so far with the security company. Have a nice day and blessed weekend. I wait your responce . Subject: RE: From Mr Fred Odia. How are you doing today my dear brother christ, I have been waiting to hear from you as you said you we contact me as soon as you are back to America, but i never received any responce from you since your last email to me, please i want you to let me know if you are not intrested again with the work of God instead of delay, because time is not in ourside, I really want us to get this project done and start with the work of God for the kingdom purpose. Please kindlly get back to me immediately. Subject: In God We Trust. .
Rev, maintain the same trust in God that you started-out with, because you are in the hands of God, and unless I'm mistaken, God said that the steps of a righteous man are ordered by the Lord. i want you to get me right so that, we can collectively get things done, the only good you can do for me now is to be 100% sincere with me so that, i won't entertain any fear or doubt about you. I don't think providing me with your phone number should not turn to a big deal.Please, if you are really sure that, you don't wanna partner with me in this project kindly let me know so that, i won't waste anytime because, no time atall.Provide me with your complete details or you let me know that, you don't wanna partner okay.Afterall, everybody involve must benefit at the end of the day but, i don't see it possible if there's no trust and proper understanding.The scriptures, two cannot work together except there's agreement.You have agree with me in the spirit so that, it manifest in the physical just for the sake of the work of the lord. What I tell you is truth. God may have sent me to you, Everything you have is what I have, period. I know that you have been doing the work of God, in a big way, since and never stopped. Like Goliath was a man of war from his youth, I've been a man of God from mine, so there is nothing new to me about the faith. I have given you all I have. You can choose to believe it or not. Whatever you chose, God knew you would. Don't forget that you are truly sent to change lives ofwhich i'm convinced in my spirit that you will surely bring it to pass. In our own time i believe we can write our names in the bible for the posterity to read and get life indeed.I pray that the grace of God will abound with you to take this project to the pinnacle of epoch making position whereby lives will be changed for better. If really you have faith in God our father, I want you to take your eyes off the road let God derive. But i wish you can call me on phone: +2348064467240. I wait you responce again. How are you today, I hope well with you may God be with you always. .Amen? Thank you for your email, How are you doing today with your family Fine i hope? Rev, I'm not a scammer and thats all. I do the right thing. If i may ask you, Have you done this before that make you know that is a scam as you said or were you scam before. I really want to let you know that this project is not a scam project but for kingdom purpose. I wish you can be able to come down here in person and see everything with your eyes, So you can make arrenagement with the security company and pick up the consignment with your hand, but also remember that the security company don't know the content of the consignment as it was deposited as "Family Treasure. (Precious items) for security purpose. If you can make up your mind and have faith in God and see the end of this project you will know that real people exite. The fear of God is the biginning of wisdom. I trust Him in all project and i beleived that he started the project and must surelly end it well to the gorly of God almight. My Brother I'm not working for anybody. If only you can take your eyes off and work with faith. I want to talk with you on phone, just try and give me a call even if is one mins. Subject: IN GOD WE TRUST. Thank you mydear brother and many blessing to you and your family in the name of Jesus Christ our Lord? I'm working with instruction given to me by late Mrs. A. Michael. A, According to the WILL, the properties have to be sold and the money will be given out to a Foreign ministry for the work of God, Orphanages and less privileges ones. As Their legal adviser, all the documents for the Properties were in my care. She gave me the authority to sell the properties and give out the fund to a Foreign Ministries for the work of God. In short, I sold all the properties after she death, as she instructed and as matter of fact, after I sold all her properties, I realized more than $15,000,000.00 (Fifteen million US dollars plus),and what supposed to be the percentage interest of my right legal fee was firstly deducted by me out of the total amount realized from the sold properties, this was base on the initial agreement between me and the owner of the properties before she death. Now, Rev. Alli need from you is your honesty as a man of God that you are, not am trying to convince you but i strongly beleive that this project must come to past, Rev i need your help to move this consignment away from the security company before their we fine out the content is money, as i know my country very well that once their fine out the consignment contain money the government over here we likelly sit on it.Promise you andyou have nothing to lose in this work Of God. Asi had already budget some funds for this project should be incase the security company demand for anything a long the line. My brother did you throughly beleive in God our father and if so, let see the end of this project because i don't belive in what people say or do. I only trust in God final. I wish you call me on phone or send me your number to call you. . Please kindly get back to me.